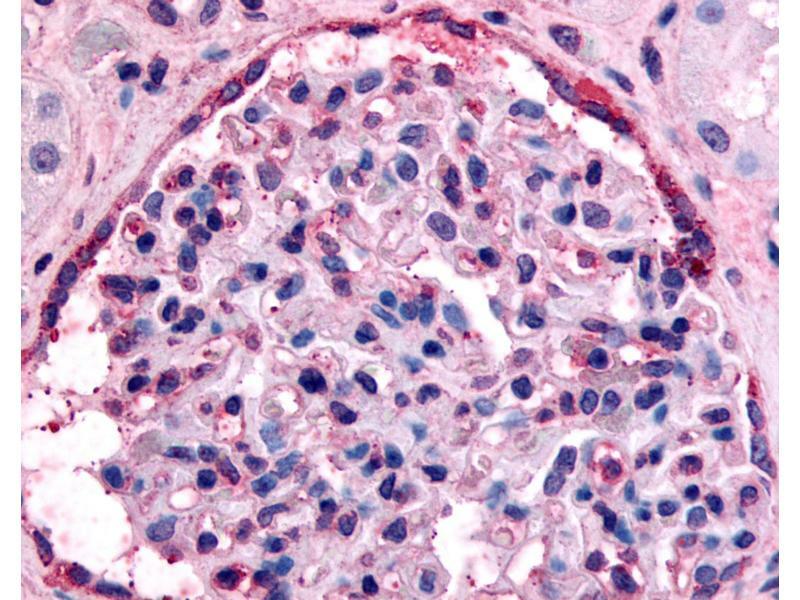 Human Glomerulus (formalin-fixed, paraffin-embedded) stained with EPHA4 antibody ABIN213398 at 18 ug/ml followed by biotinylated goat anti-rabbit IgG secondary antibody ABIN481713, alkaline phosphatase-streptavidin and chromogen. 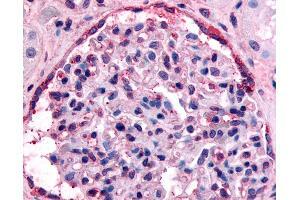 Anti-EPHA4 antibody IHC of human glomerulus. 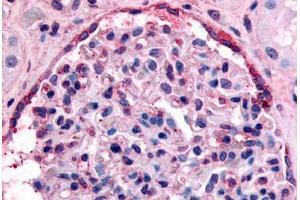 Immunohistochemistry of formalin-fixed, paraffin-embedded tissue after heat-induced antigen retrieval. Specificity Human EPHA4. BLAST analysis of the peptide immunogen showed no homology with other human proteins. Predicted Reactivity Percent identity with other species by BLAST analysis: Human, Gorilla, Gibbon, Monkey, Marmoset, Mouse, Rat, Bovine, Dog, Bat, Hamster, Elephant, Panda, Horse, Rabbit, Pig (100%) Opossum, Platypus, Lizard (95%) Turkey, Chicken (90%). Immunogen Synthetic 20 amino acid peptide from C-terminus of human EPHA4. Percent identity with other species by BLAST analysis: Human, Gorilla, Gibbon, Monkey, Marmoset, Mouse, Rat, Bovine, Dog, Bat, Hamster, Elephant, Panda, Horse, Rabbit, Pig (100%), Opossum, Platypus, Lizard (95%), Turkey, Chicken (90%). 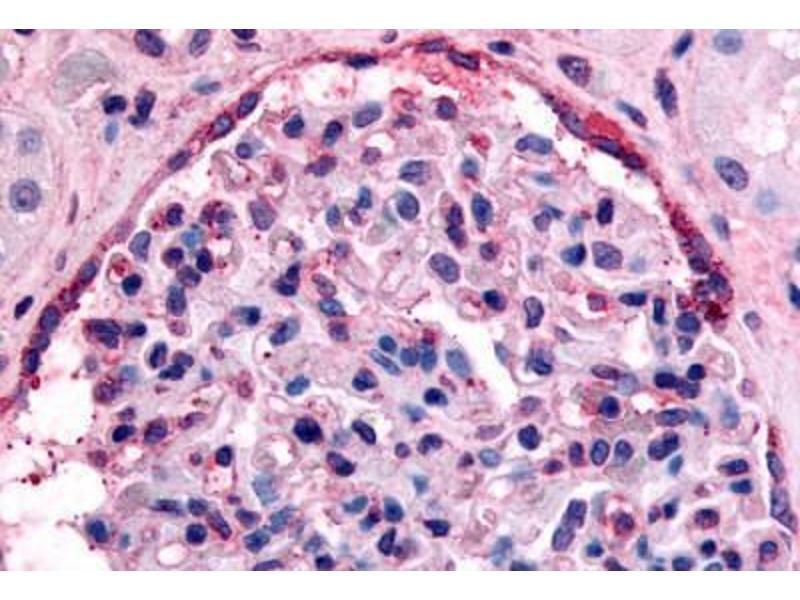 Usage: Immunohistochemistry: This antibody was validated for use in immunohistochemistry on a panel of 21 formalin-fixed, paraffin-embedded (FFPE) human tissues after heat induced antigen retrieval in  pH 6.0 citrate buffer. After incubation with the primary antibody, slides were incubated with biotinylated secondary antibody, followed by alkaline phosphatase-streptavidin and chromogen. The stained slides were evaluated by a pathologist to confirm staining specificity. The optimal working concentration for this antibody was determined to be 18 μg/mL.